The future relationship between the UK and Europe remains frustratingly unclear. 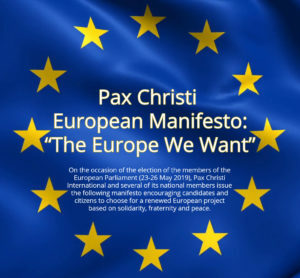 In time for the European Parliamentary elections next month, Pax Christi International have today launched a European Manifesto, subtitled ‘The Europe We Want’. The document encourages citizens of Europe to choose members of the European parliament based on values of solidarity, fraternity and peace. In contrast to the recent rhetoric suggesting that the British Trident nuclear deterrent is responsible for maintaining peace in Europe for the last 50 years, this document highlights the achievements of Europe as a ‘project for peace’ since 1945. A central ‘pillar’ of that achievement has been ‘the promotion and protection of human rights’. Read the document for yourself here.